I’m going to start saying I’m sorry for ditching this blog for half a year, but as you may know if you’ve read any other previous post, I’m quite busy usually. I am willing to start a schedule with my posts seeing people usually like them a bit – maybe twice a month updates? We’ll see. Moving on from that, I’d like to present to you a masterpost for your Back to School necessities. This goes in my own order, a.k.a. what I will be doing myself step by step. You can move them around, diss some and add others if you’d like, too. I really like my life to revolve around music. I love sad songs, I love happy songs, I love slow songs, I love dance songs, I love workout playlists and I absolutely adore music overall. It is that bad, apparently. And yes, I’m accenting a lot of words on this paragraph but my love for music is quite huge. Everyone loves music, so why not gather a few of your favorites on Spotify and stack them into a (probably disorganized) playlist. I haven’t got all that many playlists, because I gather quite a number into one category. If you’d like to check it out, here’s a link to my profile: itsmiralles. It doesn’t have to be neat and organized since I at least put playlists on shuffle and replay. Just make sure you feel okay with what you’ve added into it. Whether your body is slim or thick, everyone needs a moment to do some exercise. I myself don’t go to the gym during the year because I have no time at all to do much, hence why the summer is my time to go to the gym during an hour in the evening five days a week. You don’t really have to go the gym if you don’t want to, whether you’re uncomfortable with it or you don’t fancy it. But I do want to stress on the importance of taking an hour of your day to walk or cycle or do whatever that keeps you active and happy with yourself. It raises your self-esteem and confidence, plus you can use your music playlists to motivate yourself even more! Now, back to what you’re here for – school. Everyone needs a way of keeping track of their day, some use agendas, others use bullet journals and others use scrap pieces of paper. 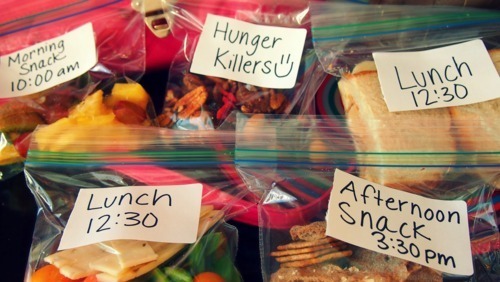 Another way of keeping yourself organized during the year and beforehand is a printable. If you’ve got Tumblr and you follow some “studyblr”s you might have seen some printables going around. You can find some great printables on theorganisedstudent, thearialligraphyproject or you can check out mine mariastudying, though there’s only two for now. The printables can make your academic and personal life much easier to keep track of. You can find calendars, productivity challenges, to-do lists; daily, weekly and semester planners,… There are many for you to choose from and you can use as many as you’d like! If you’re anything like me, after a week of hard work your motivation drops as if you’d just popped a balloon. How to fix this is quite a personal issue, but these tips may help you. Have a few motivating quotes on your desks, notebooks and agenda/planner/bullet journal, or even write some of your own on your printables if you’ve got some space. Use the Chrome extension Momentum for a lovely picture, quote and more features every day. Use the mobile app Forest to force yourself to keep working hard. I think you can also get the extension for Chrome from the official website. Have at least a full day to relax and pamper yourself each week. Alternatively, you can have a couple hours a day to spend as you please. Join a club or any extracurriculars if you can! It will make your week diverse, but it can also be time-consuming. I’m not really sure how this works in any other country or even in any other university, but in my university we use online resources for pretty much everything. There’s not many ‘books’ per say, but there’s a list of the books where the teachers have developed the presentations from. If you can, get as much material as you can, especially your class schedule and course plan, a.k.a. what the teachers will be evaluating and all the percentages from where your grade is going to come from. First off, do a general outline: use your class schedule, give yourself enough space to breathe between working hours. If you have class until 2 in the evening, don’t schedule your studying hours starting at 3 PM. Give yourself a couple of hours, and even more so if you have to drive or take public transportation home. Wait until you have been in class for a couple of weeks to know your schedule much better. Rectify so that you can be as productive as possible. If you can’t handle your schedule, shift it around until you’re comfortable with it. Do this as many times during the year as you need, since in the end, what matters is your mental and physical health. Whether you follow these steps or not, do give yourself enough space to breathe during the day. It isn’t all about studying! I can’t stress this one enough. Relaxing, sleeping, watching a TV series, a movie, going outside, staying in reading or doing nothing at all… You need to do these things in order to stay sane during the school year. You can’t spend all of your time studying. You really do need to laugh with friends, to go outside and grab an ice cream or to stay in and talk to your family. You need life experiences that studying alone won’t give you. Studying is great, but don’t make it your life. If you need ideas for outfits, food recipes, hairstyles… What’s Pinterest for? 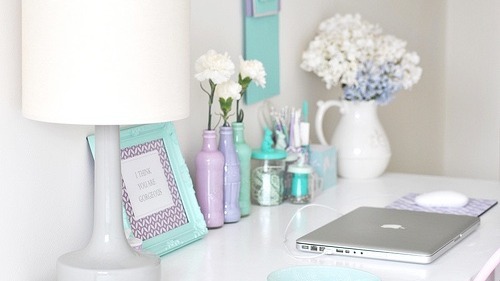 Even for desk organization, make that website your best friend. Join the “studyblr” community I mentioned before on Tumblr. I swear, just seeing others being productive will help you. Plus, there’s enormous support and resources for everyone. Be realistic with your goals througout the year so you don’t loose motivation and waste time. If you have problems with this, half the workload you scheduled for the day. Sure, you won’t be on top of your work, but you will save yourself from flanking completely. Do not let anyone tell you that you’re not worthy or talented enough for anything. You do you and follow your path. It doesn’t matter how slow you go as long as you don’t stop. Like, comment and share if you enjoyed this post and want more like this one! I really do love writing inspirational posts, because I get motivated myself. Any suggestion and feedback would be lovely. Have a lovely day and school year, x. Being unable to move after a surgery even in your own home makes you surf the web like a pro. I’ve searched a lot of stuff in the last hour and that includes the college tags on Pinterest. I cannot being to say how much Pinterest makes life ten times easier. So, today I am still hung up on the planner I talked about on my last post from Kate Spade. This woman is a queen and deserves a freaking monument made in her honor. The “I AM VERY BUSY” planners make my heart ache as well as the one I mentioned I’m going to buy. You’d think I’ve used a planner before, but I haven’t. I used journals back at school and I’d jot down every piece of homework I had to do. I’m not very consistent on that so I’d miss out on a lot of those when I started to lose motivation. To start off using a planner, I’m going to set some steps that I’ll make sure to follow as much as I can. On a little side note, remember you’re not obliged to do this ever but being organized will help you out in life so making a tiny weeny of effort now will pay off. Routines are built within three weeks so let’s get down to it. Go through your favorite store’s planners, see if one fits what you’re looking for. If they don’t, surf the web and find it! If it’s a bit into the pricey side, try to gather enough money and get it before your college starts. You want to find one that includes more or less from this August to December next year (these are the 17-month planners!). Make sure you’ll be able to start from the moment you arrive there, guys! As I said on my previous post, you’re going to have to be very aware of your email and syllabus. This is going to be very important for the next steps so make sure to be very conscious about both things at all times. Once your planner has arrived and you’re jumping around in your room all happy, you should grab your syllabus and write down everything listed on the due dates. I recommend color-coding. Why, you’d ask, or how am I going to keep it up. Well color-coding makes everything easier to scan through. You can write a legend and add it into your planner with a simple DIY so you can move it around as you go. Grab a piece of paper or cardboard and cut it so it fits your planner as you want it to. Punch some holes into it after measuring the spaces to meet your journal’s and cut slits in the middle so you can slip it into the book. Write down the color-code you like best (you can get some inspo on Pinterest or on Tumblr’s studyblr community!). 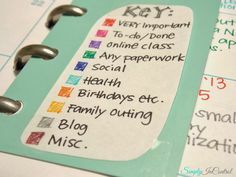 Whether your planner has a meal list, shopping list, to-do list, or any other extras, make the most out of it! You bought it, so use it! I know that if I want to, I’ll keep it up. So, keep yourself motivated, enjoy those colors and stickers you’re using on your lovely planner. Add in your doctor’s appointments, your workout schedule, your blog/online/writing/creative duties, some friends outing, important occasions like your family’s and friends’ birthday… It will be part of your life, because it actually holds all your life! You’ll definitely love it. You can even add the books you’re interested in purchasing and reading! Just make it work for you and make it comfortable. If a planner is not your ideal thing, go for a wall-calendar or use an online planner or calendar, such as Google Calendar or One Note. I’m currently using the latter for to-do lists and it really does help. Though, I’m one of those people that like to cross out something on a paper and feel a huge satisfaction out of it. Also, if you lose motivation for it, go through Pinterest and some blogs and you’ll definitely want to pick your planner back up! Or even check on this blog, I’ll definitely have some stuff gathered for you to fall in love with your agenda once again. Comment down below if you’ve got any planners and tell me how you use them! I’d love to see your creativity with these. Have a great day! This is my nth time making a blog during my short lifetime but this is a blog I’m at least mentally hoping to keep up during my college/university years (and maybe even further on!). As this is my first post, I’m going to be introducing myself a little, too. My name is Maria and I’m going to be a starting college in the fall, which I’m very excited about. I’m quite young and not a native English speaker, but I’m going to try my best to make the least mistakes possible. On to the actual deal now. I’m guessing there’s thousands of people (maybe even millions) that are just as eager, scared and overall confused regarding what to spend money on for their first year. I’ve been told so many times about how university is so much different from high school in pretty much everything, from classes, ways to study to people, attitude and seriousness. In high school, your teachers are ON FREAKING TOP OF YOU SO YOU DO YOUR HOMEWORK. At least, that’s my experience and I hated it. I’m very capable of being responsible all by myself and handing in my assignment when it’s due. Therefore, let’s keep our minds, eyes and ears open. Check your university’s page and your email DIALY because there may be some change of plans and you should be up to date. Now, in Spain, you have five classes per semester in your own field. But fix this to your own schedule and subjects. Mine is Computer Science, so let’s go with that example. I have five classes regarding Computers, most of them including algebra or regarding mathematics. Now that we are up to date with everything and have an overall look into our degree, we need a supplies list. Why is this in bold, you’d think? Well, planners are so, so important. I’ve never used one like the ones I’ve seen on Pinterest before, but believe me when I say you’ll need this as soon as you grasp the concept. I’m going to be earning money for a Kate Spade planner. I’ve seen others going around that also look amazing, but I can’t spend $50 or $70 on a planner when I have to buy all of the list. There’s amazing things of hers’ on the site that you should check out and maybe buy if you can afford. Washi tape, sticky notes and flags, colorful stickers. Books (check for used ones if you can’t afford new ones!). Paper clips – every single kind there is!, tape, staples. Manila folders (there’s some Kate Spade ones that are sooo pretty!). As my subjects lean very into Science, I’m going to possibly need a graphic calculator, too. You might want to get a scientific one if any of your classes have simple mathematics, even if your degree isn’t maths-related. I’m going to be living with my parents, as a bus stops close-by and travels all the way to my university every morning, afternoon, evening and night (depending on the students’ schedule – some have to go in the afternoon). But I know about dorms, so you might want to check everything your university will let you have there (microwave, coffee-machine…) so you can jot down a list for different things: kitchen, bathroom, bedroom, desk and laundry. The desk part we’ve got almost covered up on the previous list. Kitchen: again, check for what you’re allowed to take: mini-fridge, microwave, coffee-machine… You’ll anyway have to have some dry food or food that won’t go to waste in two days after arriving there as well as some zip lock transparent bags. Of course you’ll need glasses at least, maybe a few dishes and cutlery. Check if you can take a water purifier pitcher as well! Bedroom: bedsheets, a couple blankets, a beanbag, a good-sized mirror, pretty pillows and cushions, a bed-side lamp, flowers… For your wardrobe, you’ll definitely want to pack lightly thanks to the rest of stuff that’s already too much for you to handle. I’d recommend five or six complete outfits, i.e. a black long-sleeved basic shirt, a flowy, knee-length black and white stped skirt, tights and cute flats. That’d be one outfit. Make them simple so you can combine all of them and they definitely have to be as comfortable for you as possible; leggings and a hoodie is good for me most of the time. Desk: we’ve already set the essentials up on our list, so this is just a filler for dorm rooms. You would want to take your laptop, tablet, phone with you with the respective cases and accessories (mouse, keyboard for some tablets, chargers and headphones). I’d suggest for you to have a small hand sanitizer with you at all times. You never know when you’ll need it. We’re done with the listing, all there’s left to do is gather some motivation and keep ourselves calm until the day comes. I’ll keep on posting about college tips and tricks as I go along hunting through Pinterest, Tumblr and other bloggers. Any mention to Kate Spade is in no way promotion, it’s just me loving her chic and girly products. Comment if you have anything you’d like to add to the lists or you’ve got some tips and tricks to share! I’d love to have someone with experience also commenting about what the first year of college is like.